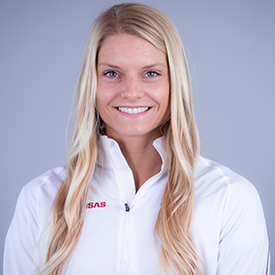 First-team All-American (4-x-100-meter relay), NCAA outdoor honorable mention (heptathlon) … Utilized a medical redshirt during the indoor season … Made her 2018 debut with a first-place finish in the 100-meter hurdles at the Arkansas Spring Invitational … Opened up in the heptathlon at the Texas Relays where she finished as the third-best collegian with 5,880 points … Captured two event titles at the Baylor Invitational winning the 100 hurdles and the 4-x-100-meter relay … Placed second in the 100 hurdles and shuttle hurdle relay at the SEC Relays … Kicked off postseason scoring 12 points for Arkansas at the SEC Outdoor Championships off a heptathlon All-SEC and PR performance of 6,023 points (fourth in program history) and a fifth-place finish in the 100 hurdles … Qualified for nationals in the heptathlon and with the 4-x-100-meter relay … Part of the program record-breaking 4-x-100-meter relay team that finished sixth at the NCAA Outdoor Championships (43.34 in the prelims, 43.68 in the finals) … Qualified for the USATF Outdoor Championships where she wrapped up her junior season. Outdoor first-team All-American (heptathlon), Outdoor second-team All-American (100H), Two-time first-team indoor All-American (60mH, pentathlon) … Made her Razorback debut at the Arkansas Invitational clocking 8.25 in the 60-meter hurdles to launch up the SEC and NCAA leaderboards … Ran the second-fastest time in the 60-meter hurdles in Razorback history of 8.16 during the pentathlon competition at the Razorback Invitational … Scored seven points at her first SEC Indoor Championships with a bronze in the 60-meter hurdles and an eighth-place finish in the pentathlon … Qualified for the NCAA Indoor Championships in the 60-meter hurdles and pentathlon … Had career-best performances in all five pentathlon events scoring 4,371 to place fifth at the national meet … Fourth best pentathlon performer in Arkansas history … Helped the Razorbacks rewrite history as the only program to ever have three combined events performers score at a national meet … Broke Arkansas’s 60-meter hurdle record clocking 8.09 in the finals section of the open race to place seventh at indoor nationals … Kicked off outdoor season with runner-up finishes in the heptathlon and 100-meter at the Clyde Littlefield Texas Relays with a career-best score of 5985 and time of 13.18 … Went on to set a new 100 hurdle program record, clocking 12.83 in the event at the John McDonnell Invitational to place first overall … Scored seven points towards the Razorbacks’ Triple Crown victory at the SEC Outdoor Championship as the bronze medalist in the heptathlon and the eighth-best performer in the 100 hurdles … Earned an NCAA berth in the 100H and the heptathlon where she went on to cap her first year as a Razorback, placing 12th and sixth, respectively. Finished 10th in the pentathlon at the Big 12 Indoor Championship with 3,633 points … Finished eighth in the pentathlon at the Razorback Invitational with 3,391 points … Placed seventh in the high jump with a clearance of 5-02.25 (1.58m) at the Texas A&M Quadrangular … Finished second in the 60-meter hurdles with a time of 8.62 at the Texas A&M Quadrangular … Won the 60-meter hurdles with a time of 8.60 at the J.D. Martin Invitational, a mark that put her at fifth in all-time OU indoor history … Finished 13th in the shot put with a throw of 36-06.25 (11.13m) at the J.D. Martin Invitational … Runner-up in the 100-meter hurdles at the Rafer Johnson-Jackie Joyner-Kersee Invitational with a time of 13.74 … Finished sixth in the heptathlon at the Clyde Littlefield Texas Relays with 5,422 points … Finished fourth in the 100-meter hurdles with a time of 14.22 at the Baldy Castillo Invitational. From sophomore (2012) to senior (2014) year of high school she finished in the top ten in Arkansas in outdoor and indoor each season, finishing with the top spot in both categories her senior year. Was ranked as high as 18th in the country in indoor and 36th in outdoor her Senior year. Won the 7A state title in the 100-meter dash her junior and senior year. Also, a state champion in the 100-meter hurdles her senior year. Won the 200-meter dash as a junior and the 300-meter hurdles as a sophomore at the Arkansas State Meet of Champions. She is also a one-time girls high jump state champion. Born on November 29, 1995 … Daughter of Lance and Christina Stumbaugh … Has two sisters Olivia and Sophia … Majoring in kinesiology with a focus in physical education k-12.